Guiding Hand School students pictured from left to right include Anthony Lambert, Austin Saunders, Jasmine Knight, Maurice Knight, Chelsie Mullins, Michael Lundy, Ondre Newcomb and seated is Malachi Markin. 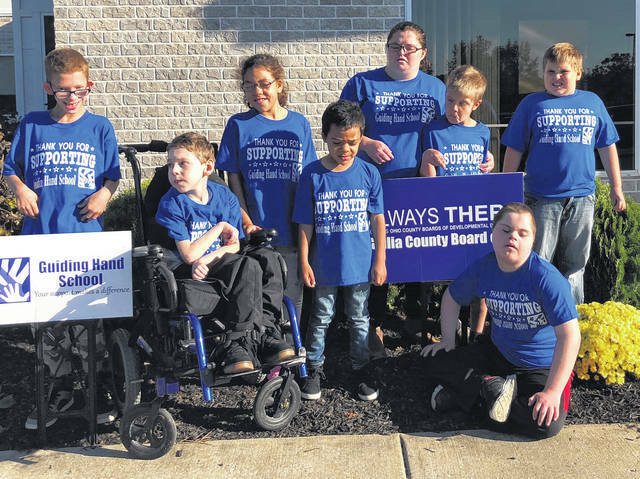 GALLIPOLIS — Gallia Board of Developmental Disabilities Superintendent Pamela Combs and the rest of the board are gearing for the November election which will determine whether the board will be able to keep open its Guiding Hand School facility. The board is asking Gallia County residents to consider a one mill increase continuing levy. According to Combs, currently the board operates on a levy of 1.8 mills. The board’s overall budget sits at $2.7 million with the 1.8 mill levy bringing in $1,223,547. Should the levy pass, it would bring in roughly an additional $800,000. The rest of the board’s budget is compromised of state funding from the Ohio Department of Education to run the school and correlates to students who would have been attending the public school system. Combs said should the levy not pass, the children served by Guiding Hand would integrate with the students in the public schools. Guiding Hand School has served as both the administrative offices for the board as well as a school for area Head Start students and school age students utilizing the board’s services. Combs said Gallia is among the lowest of mill levy totals received by a county board of developmental disabilities throughout the state. Her reports states Gallia is the 85th lowest out of 88 counties across the state. Combs said students who are eligible to receive Guiding Hand School’s developmental disability services are then qualified to receive the board’s services for life. Funding may fluctuate slightly from year to year, but those children eventually become adults, as others in the past, and may need assistance with finding work, medical needs and more well into their senior years. Dean Wright can be reached at 74-446-2342, ext. 2103.